But I also love fire. 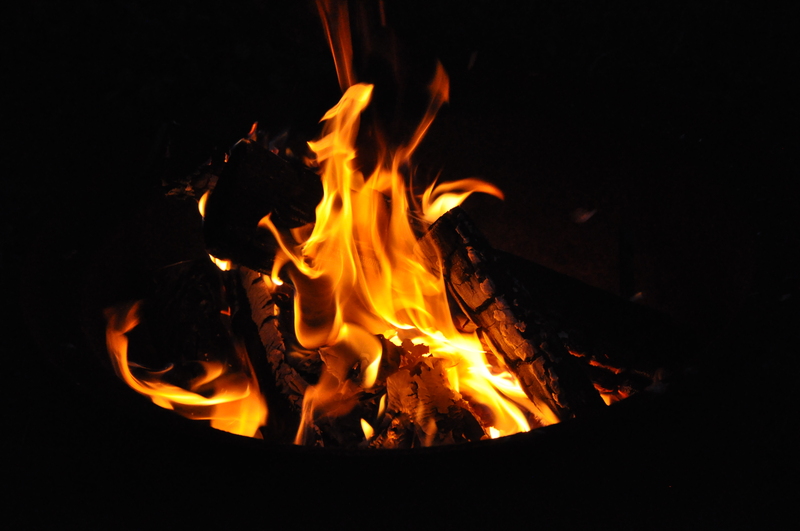 Not the horrifying, dreadful, deadly type of fire that tries to kill you, but the relaxing cackle of a controlled fire in the fireplace, or in the backyard fire pit. I remembered how much I enjoyed it at the cottage as a child when we’d start a fire in the pit next to the lake and roast marshmallows while the lake gently slapped against the rocks. 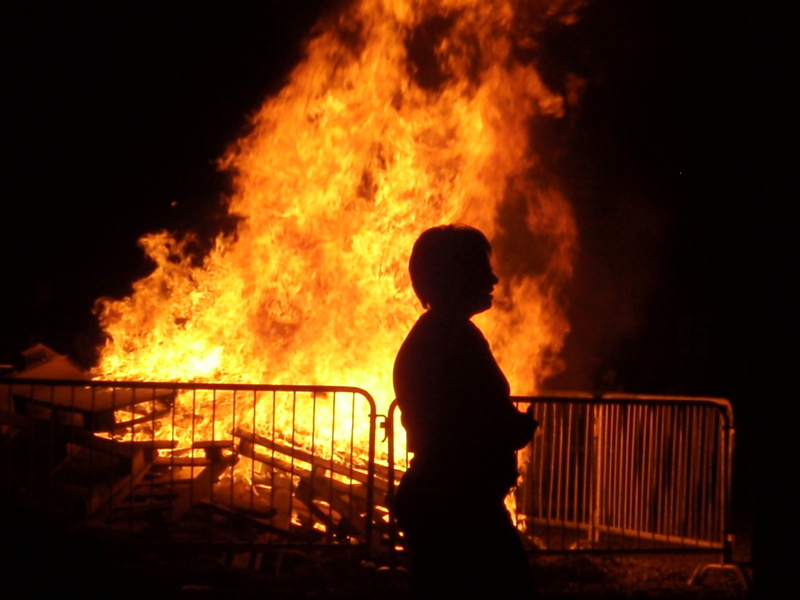 I remember how fascinated I was when we’d watch the fire turn green from the staples on the fruit baskets we were burning. I enjoyed the effort it took to get that marshmallow just perfect. Everyone had their own style. Some of us would hold the marshmallow just close enough to the flame or embers to give the marshmallow a nice, light brown, slightly crispy skin. Others would stick it right in there, let it catch fire in a fiercely, fiery rage, and then run around the pit, shaking your stick and blowing on it to get the fire out and eat the black, crusted shell holding the goo in place. As I was writing this, I decided to see if there were any funny memes about different the different ways people roast their marshmallows, and I found this from blogger MamaDweeb. 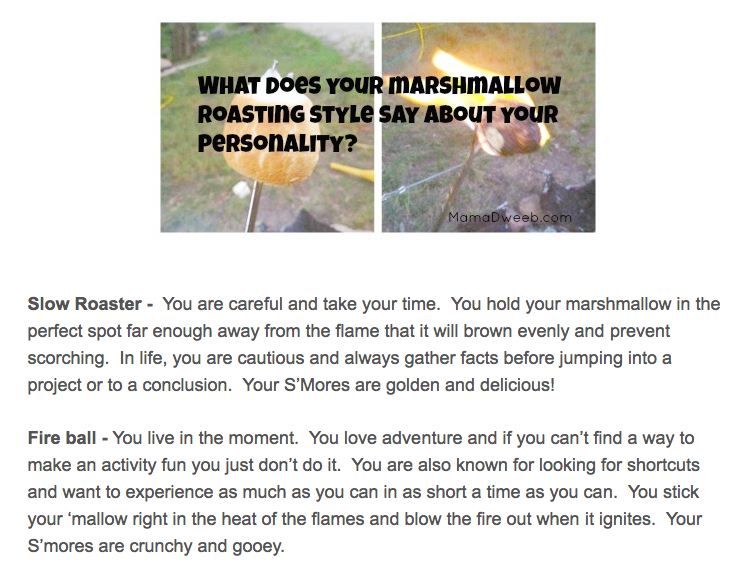 What your personality type is based on how you roast your fluff. Pretty neat! I alternate between Slow Roaster and Fire Ball, but if I was roasting them for S’mores, I think I would roast them slowly so as not to overpower the flavour of the chocolate/grahamy goodness! We had a good one for St.-Jean Baptiste Day one year! ← E is for Elephants!